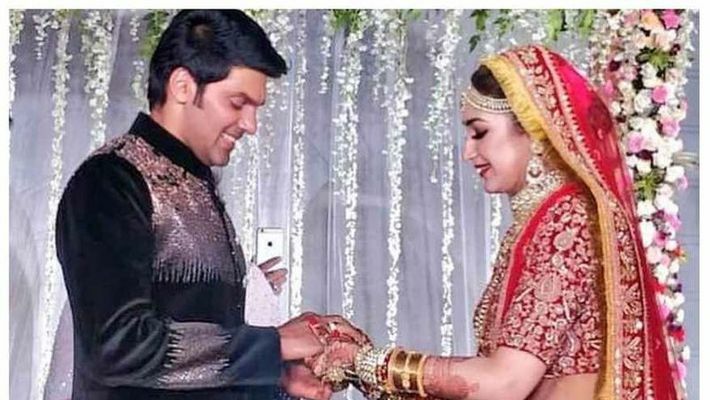 Tamil actors Sayyeshaa Saigal and Arya tied the knot in Hyderabad. They hosted a grand wedding dinner, which was attended by several south actors such as Karthi and Suriya. Shivaay actor Sayyeshaa Saigal, grandniece of veteran actor Saira Banu and daughter of actor Shaheen, tied the knot with Tamil actor Arya at Hyderabad’s Falaknuma Palace. The two got married in the presence of family and close friends. Sayyeshaa looked beautiful in a traditional red and golden lehenga with bridal jewellery for her wedding whereas Arya complemented her in a black and golden sherwani-salwar. Arya and Sayyeshaa also had a Muslim wedding ceremony later. The actors' romance started from the sets of Ghajinikanth, which released in 2018. Arya is 17 years older than Sayyesha. The couple is currently filming Kaappaan, also starring Mohanlal and Suriya. Kaappaan is scheduled to release in October. Both took to their social media pages on Valentine's Day and made an announcement about their wedding in March. A few pictures from the wedding were shared on social media where we can see several south actors like Rana Daggubatti, Suriya Sivakumar, Karthi and filmmaker Rajsekar Pandian, who attended the wedding and later posed together for pictures. Arya has worked in several south films like Madrasapattinam, Raja Rani, Boss Engira Baskaran and Avan Ivan. On the other hand, Sayyeshaa has also worked in a few south films including Junga, Vanamagan and Kadaikutty Singam besides featuring in Ajay Devgn’s Bollywood film Shivaay.